The past year has been brutal for the cryptocurrency industry. After having topped out near $20,000 in December 2017, bitcoin has seen its price fall more than 80% from its highs. 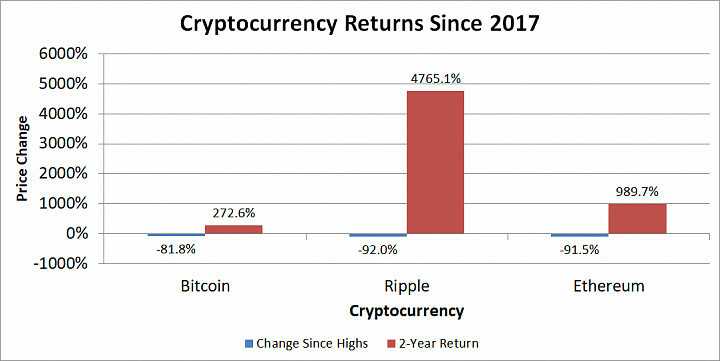 Other major cryptocurrencies, including ripple and ethereum, have seen even bigger declines over the same time frame. The fall of bitcoin and its peers have led some to conclude that crypto-investing is dead. Indeed, many trend-following investors have turned to other investing themes, such as marijuana stocks, as an alternative. Yet advocates for bitcoin will note that the cryptocurrency has seen multiple pullbacks of this magnitude before. Each time, skeptical investors left the industry for dead -- and each time, it climbed to new highs that many would have thought were impossible to reach. It's easier to see this when you look at how crypto prices have moved since the low point of the previous price cycle. The chart below gives you a better sense of the returns that long-term investors in bitcoin and other tokens have seen. Data source: Coinmarketcap.com. Chart by author. Obviously, there's no certainty that bitcoin will be able to rise from the ashes this time around. Yet if history is any guide, cryptocurrencies certainly have the potential to bounce back. Those who still advocate for the value of crypto-token technology see plenty of good prospects for the market -- and they're optimistic that prices will not only return to their early 2018 levels, but eclipse them in time. Neither Dan Caplinger nor the Motley Fool have any interests in the cryptocurrencies mentioned in this article. The Motley Fool has a disclosure policy.